The event held in Beirut on 15 February discussed strategies to enhance refugee assistance in Lebanon, with a view to promoting access to decent work, social protection and public services. PSI General Secretary Rosa Pavanelli and union leaders from PSI Swedish affiliates (ASSR, Vardfordbundet, ST, Vision and Kommunal) attended the meeting alongside members from the General Confederation of Lebanese Workers, Ministry of Social Affairs, ILO and UNHCR. 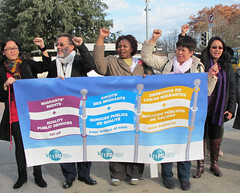 On 18 December 2012 – United Nations International Migrants Day - “Workers’ solidarity is needed in times of crisis,” says Rosa Pavanelli, General Secretary, Public Services International. This return and reintegration to South Africa kit offers basic information about relevant topics to help South African migrant workers who are planning to return home after taking up employment overseas. The kit aims at empowering workers to make informed decisions and raise awareness of the issues related to their return home. 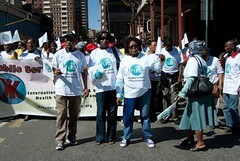 The passport for worker and union rights in South Africa has been developed by PSI and its affiliated trade unions in order to provide migrant workers with essential information related to their rights, recruitment, documentation and employment before they migrate to South Africa. It also covers those migrant workers already working in the country. Join the PSI campaign to abolish the practice of charging of recruitment fees on migrant workers. Sign on to the Manifesto and use it to shift policy and practice towards fair and ethical recruitment. #NoRecruitmentFees. This policy brief on Migration was produced for the PSI Executive Board EB-148 held at the ILO in Geneva (Switzerland) on 19-20 May 2016. Its objective is to provide EB-148 with an overview of the current global humanitarian crisis. The brief is available in English, French, Spanish, German, Swedish and Japanese. This booklet is a PSI Return and Reintegration Kit that was produced in 2015 in collaboration with the ILO Decent Work Across Borders Project. This return and reintegration booklet contains basic information about relevant topics to help Filipino migrant health workers who are planning to return to their home countries after taking up employment overseas. This pre-decision booklet contains basic information about several topics to help Filipino health workers who are considering taking up employment overseas. It seeks to empower health workers to make informed decisions and raise awareness of the issues related to health labour migration and ethical recruitment. This pre-decision booklet contains basic information about several topics to help Indian health workers who are considering taking up employment overseas. It seeks to empower health workers to make informed decisions and raise awareness of the issues related to health labour migration and ethical recruitment. This pre-departure booklet contains basic information about several topics to help Indian and Filipino health workers who are bound to work in Norway. 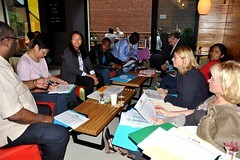 The Initiative on Child Rights in the Global Compacts, which PSI is part of, is organising the Global Conference on Children on the Move taking place in Berlin, Germany, on 12-13 June. During this conference, participants will assess progress and develop strategies around implementing commitments to children on the move. The Culmination Conference of the PSI Project on Decent Work and Social Protection for Migrant Workers in the Public Services is taking place at the Reef Hotel in Johannesburg, South Africa on 13 January 2017. PSI will be attending the informal interactive multi-stakeholder hearing on 18 July 2016 as part of the lead-up to the UN high-level plenary meeting on addressing large movements of refugees and migrants to be held on 19 September 2016. The Migrant Desk will provide information, counselling, organizing, support services and networking for migrants, prospective migrants and returning migrants.